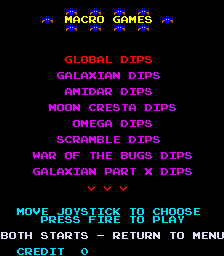 Recommended setting is put all DIP switches to OFF, and then switch 3 (3rd one away from the CPU on most boards) is used to enable the 'Setup Menu'. If this switch is off, then the setup option will not appear on the main menu, and hence no settings can be changed. If the switch is ON, then your menu will look like the one pictured below. Selecting this option will bring you to another menu where you can configure the global settings (settings applicable to all of the games) and also the individual settings for each of the games included. n.b. not all games have selectable items, in which case they will not appear on this list. The individual game options are self explanatory, and usually feature items such as number of lives, bonus levels and difficulty settings. 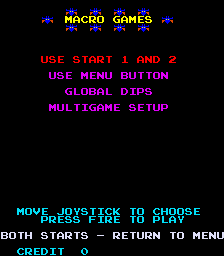 You can change these around as much as you wish, but all of the games default to 'factory settings' where known, so should be most likely to match the machine you played in the arcade years ago. If we now examing the 'Global Options' setting, we can see the current settings for each option displayed on the menu. We'll step though each of these in turn and show the possible selections. These are mostly self explanatory, so I'll keep descriptions to a minimum! No longer do you need to solder a wire to the loom to ground the table pin (especially since it's been re-used for one of the controls!) - now you can tell all of the games what table type to use from here. Now if you put a galaxian PCB in a standard Jamma cab, set for vertical screen orientation, there's a chance it will be upside down. 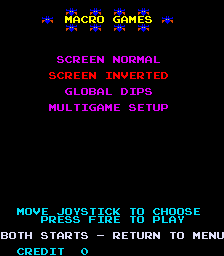 (depends upon the rotation mechanism - mine lets me rotate it anyway you fancy) - but, based on a request from one of the customers, a screen invert as featured on most modern jamma boards. How do you get back to the menu ? 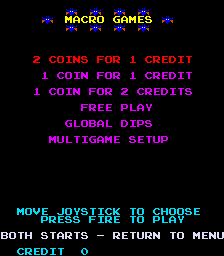 - default is to press both Start 1 and Start 2 at the same time, since this can use a credit if you are sitting in the attract mode of any of the games, there is also the option to add a special 'Menu' button. This needs additional wiring as it re-uses one of the DIP switches. 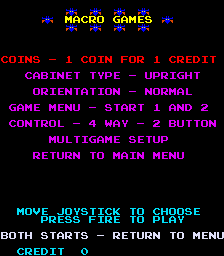 If you tell the menu system what controls you have fitted to the cabinet, it can restrict the selection of games to ones that can be played using those controls. 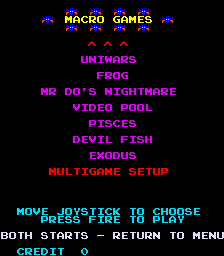 4 way 2 button is only required by Scramble, 4 way 1 button is needed for Mr Do's Nightmare, Amidar, War of the Bugs, Devil Fish, Frog and Ladybug and 2 way 1 button handles the rest. 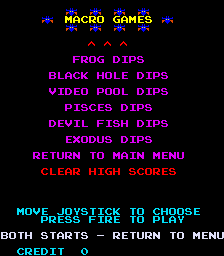 The final option worth mentioning is 'Clear High Scores' - if the scores get corrupted for any reason, or if you are just fed up with having your sister beating your best on Amidar, simply select this to return them to the easier to beat default scores. 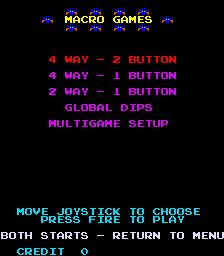 You will have to confirm the selection on the next screen, just to make it a little trickier to select by accident.